const char EMPTY_BINARY_BUCKET  = ""
const char SYSTEM_FROM  = "Second Life"
Constants and functions used in IM. Definition at line 317 of file llinstantmessage.cpp. References ll_sd_from_vector3(), params, and S32. Definition at line 349 of file llinstantmessage.cpp. Definition at line 160 of file llinstantmessage.cpp. 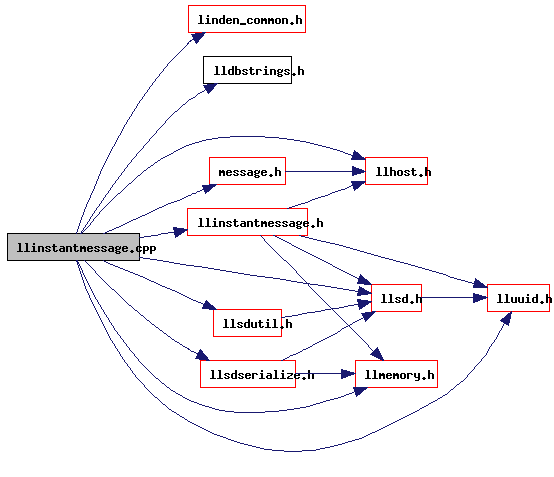 References _PREHASH_ImprovedInstantMessage, lldebugs, llendl, LLMessageSystem::newMessageFast(), and pack_instant_message_block(). Referenced by busy_message(), LLToolDragAndDrop::commitGiveInventoryCategory(), LLToolDragAndDrop::commitGiveInventoryItem(), deliver_message(), LLFloaterIMPanel::onClose(), process_improved_im(), send_improved_im(), and LLFloaterIMPanel::sendTypingState(). Definition at line 199 of file llinstantmessage.cpp. References _PREHASH_AgentData, _PREHASH_AgentID, _PREHASH_BinaryBucket, _PREHASH_Dialog, _PREHASH_FromAgentName, _PREHASH_FromGroup, _PREHASH_ID, _PREHASH_Message, _PREHASH_MessageBlock, _PREHASH_Offline, _PREHASH_ParentEstateID, _PREHASH_Position, _PREHASH_RegionID, _PREHASH_SessionID, _PREHASH_Timestamp, _PREHASH_ToAgentID, LLMessageSystem::addBinaryDataFast(), LLMessageSystem::addBOOLFast(), LLMessageSystem::addStringFast(), LLMessageSystem::addU32Fast(), LLMessageSystem::addU8Fast(), LLMessageSystem::addUUIDFast(), LLMessageSystem::addVector3Fast(), EMPTY_BINARY_BUCKET, EMPTY_BINARY_BUCKET_SIZE, llendl, llmax(), llmin(), llwarns, MTUBYTES, LLMessageSystem::nextBlockFast(), NULL, and S32. Referenced by pack_instant_message(), and LLIMInfo::packMessageBlock(). const char EMPTY_BINARY_BUCKET = ""
Definition at line 59 of file llinstantmessage.cpp. Referenced by inventory_offer_callback(), pack_instant_message_block(), send_group_notice(), send_simple_im(), and send_start_session_messages(). Definition at line 60 of file llinstantmessage.cpp. Definition at line 49 of file llinstantmessage.cpp. Referenced by deliver_message(), LLViewerChatterBoxInvitation::post(), and process_improved_im(). Definition at line 48 of file llinstantmessage.cpp. Referenced by busy_message(), LLToolDragAndDrop::commitGiveInventoryCategory(), LLToolDragAndDrop::commitGiveInventoryItem(), deliver_message(), inventory_offer_callback(), join_group_callback(), LLFloaterIMPanel::onClose(), process_improved_im(), LLPanelFriends::requestFriendship(), send_group_notice(), send_simple_im(), LLFloaterIMPanel::sendTypingState(), and session_starter_helper(). Definition at line 63 of file llinstantmessage.cpp. Definition at line 61 of file llinstantmessage.cpp. Referenced by LLToolDragAndDrop::commitGiveInventoryCategory(), LLToolDragAndDrop::commitGiveInventoryItem(), inventory_offer_callback(), send_group_notice(), send_simple_im(), and session_starter_helper(). const char SYSTEM_FROM = "Second Life"
Definition at line 62 of file llinstantmessage.cpp. Referenced by LLIMMgr::addSystemMessage(), busy_message(), LLVoiceChannelGroup::handleError(), and process_improved_im(). Definition at line 53 of file llinstantmessage.cpp. Definition at line 55 of file llinstantmessage.cpp. Definition at line 52 of file llinstantmessage.cpp. Definition at line 56 of file llinstantmessage.cpp. Definition at line 57 of file llinstantmessage.cpp. Definition at line 51 of file llinstantmessage.cpp.